I wrote about using Perfect Audience to set up an effective remarketing campaign in my “8 remarketing tips to get visitors back to your website“, and wanted to follow that up with this post that highlights some banner ads you can use. Remarketing works great when you do it right, and a hugely important piece of setting up a campaign that’s effective has to do with the look and feel of your banner ads. 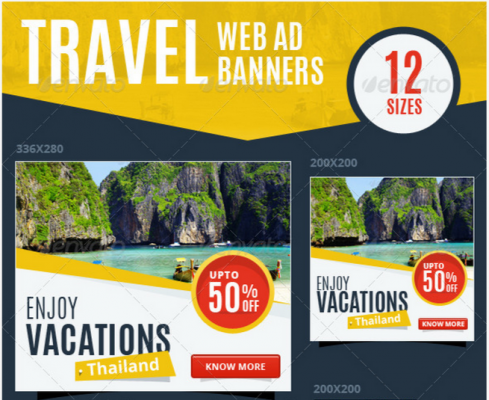 Not all of us have sick graphic design skills, but luckily there are plenty of templates out there designed specifically for banner ads. You can use these to get a jump start on your ad creatives and save a ton of time and money when it comes to designing a professional looking campaign. When you’re running display ads, it helps to have a repository of good creatives you can refer to for various events, times of the year, products, or other styles that fit your needs. Larger companies and advertising agencies might have the luxury of an in-house graphic designer, but what about the rest of us? Designing a display isn’t really ad difficult as it seems, and perhaps the biggest hack you can use to save time is purchasing pre-made templates that you can customize fairly easily assuming you have some basic Photoshop skills. I love Graphic River for their huge selection of very high quality products. 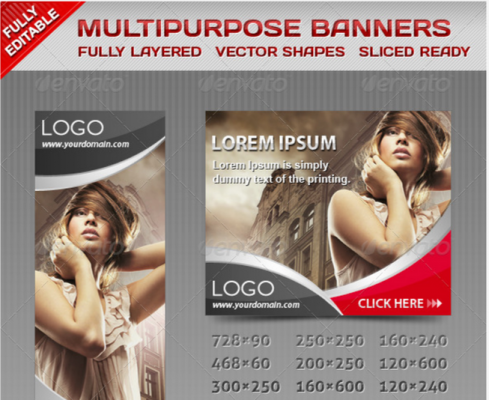 For as little as $4 you can have a nice package of display banners in Photoshop format. All it takes is a bit of time on your part to decide what image and copy you want to use, and perhaps some color changes. You can then post a simple job request on Elance, Odesk or some similar site to get the design finished. 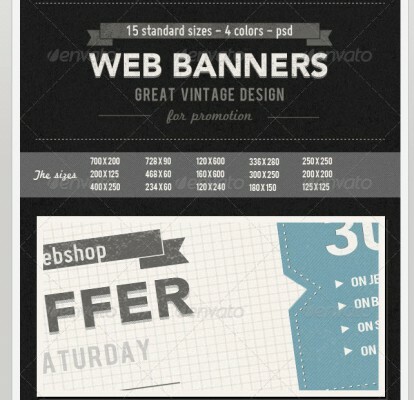 These banners have a vintage look an feel to them, and would be great for a bohemian clothing store or anything else where you’re trying to capture a clean retro feel without being too “out there”. 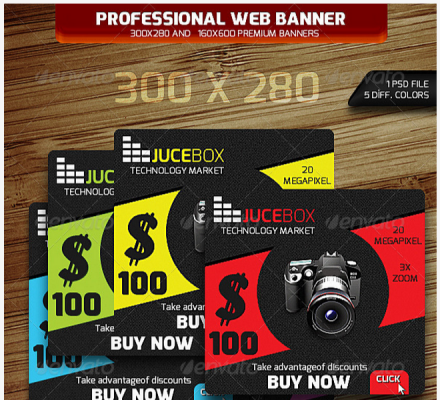 This set of banners offers a clean design that’s suitable for just about any ecommerce shop. For a few bucks you get 18 different sizes, complete with vector shapes. 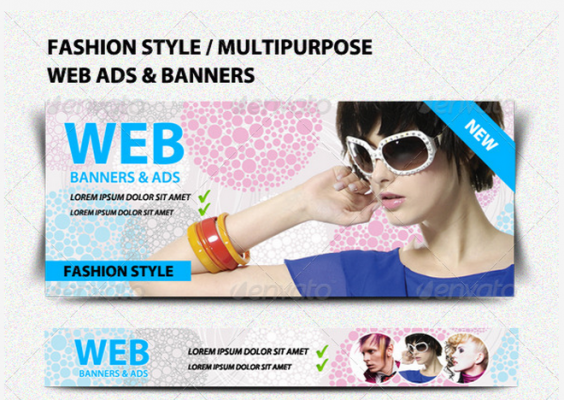 Here’s a set of banners designed with a slick, modern feel that might be better suited for fashion, makeup, or glamour stores. Another set designed with a whimsical look and feel that’s suitable for fashion, clothing or artistic sites. These banners have a clean look and feel that’s best for tech sites and B2B sites looking to get a few simple points across. 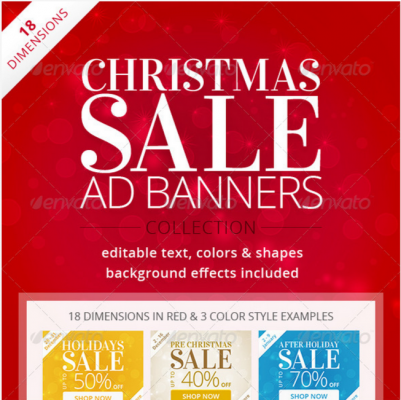 It’s always smart to design ads for the context they appear in, Although these come ready made and designed for Christmas, the layout can easily be modified to work for a variety of other holidays, winter sales, and so on. This set comes with 18 sizes so you have a ton of options for placement. In my previous post on remarketing strategies I touched on using product-specific ads to deliver the most relevant display ads to your customers. 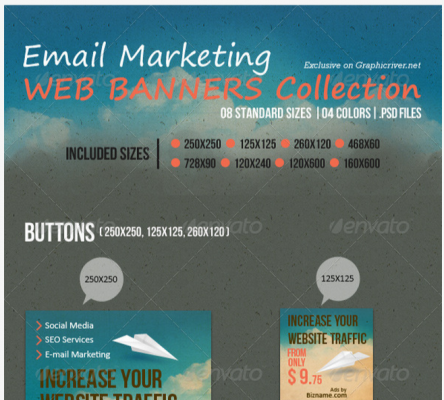 This set of banners would work perfectly for highlighting single products and the look and feel is generic enough so it could work for almost any site. 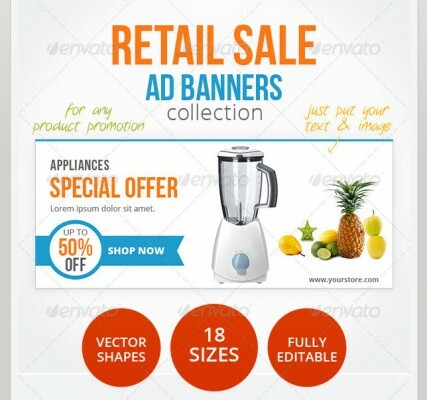 I recommend checking out the full collection of banner ads on Graphic River. There are plenty there to choose from and the ones I included above barely skim the surface.